Stuff 'em full, portobello mushrooms! Cut out the stems of the mushrooms and gently rub the mushrooms clean on a paper towel. DO NOT wash or soak mushrooms. They retain a lot of water. Place mushrooms on a cookie sheet, with the underside facing up. Sprinkle a little salt and pepper. Bake mushrooms for 15 minutes. Rinse the peppers with cool water, cut in half, scoop out seeds, and roughly dice the peppers. Chop up onion and garlic. In a large, hot, sauté pan, add 1 tablespoon extra virgin olive oil, then add the peppers, onion, and garlic. Cook for about 10 minutes. Follow the instructions for the stuffing mix. You can cook the stuffing right in with the sautéed peppers. Once the stuffing is all cooked, place a scoop of the stuffing and peppers mix on each portobello mushroom. When all the mushrooms are stuffed, place back into the oven for 10 minutes, or until the top is golden and crispy. I plated this stuffed mushroom on a bed of arugula; any mixed greens or salad can work. 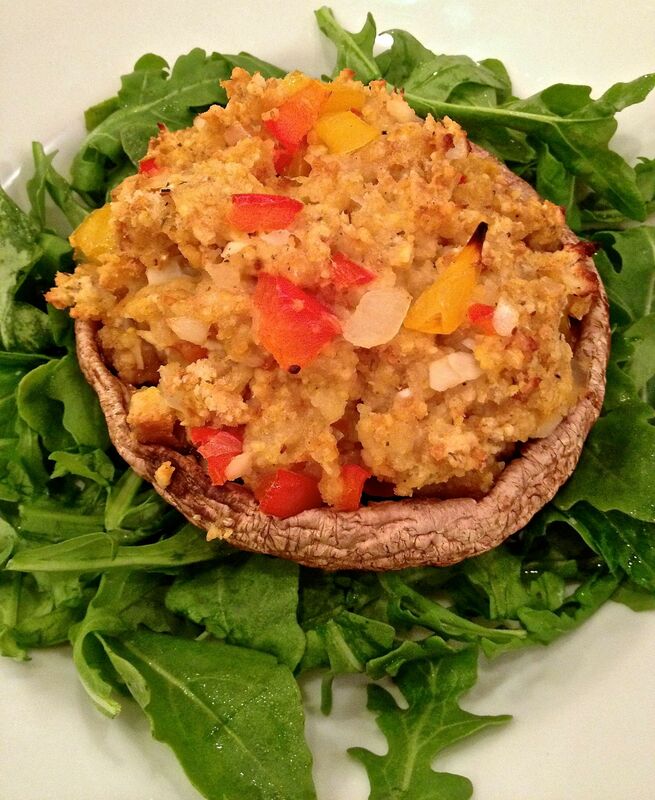 But, this stuffed mushroom is hearty enough to stand on its own, or as a side.